In my free time, you can usually find me on a bike. Just Documenting And sharing some of my adventures. Just a place to keep an ongoing list of overnighters I want to do. If you have routes or suggestions, let me know! For morning train rides with bikes, a thermos of hot coffee is highly recomended. 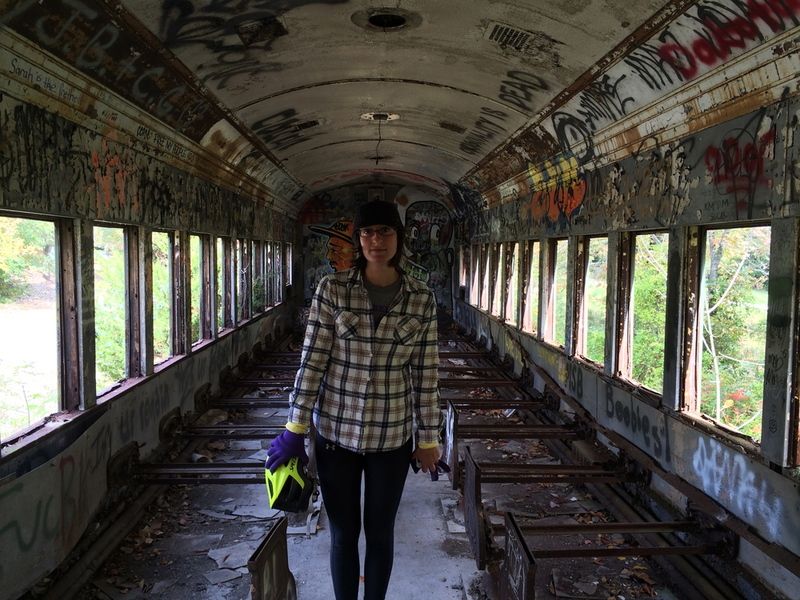 We made only one wrong turn during the trip, but fortunately it lead us to this abandoned train car. When you're camping and it's cold, you make a fire in the morning too! A leaf peeping one night bike camping trip from Philly to Trenton via train, and then from Trenton to Ringing Rocks Park via bike. What we thought would be one of the last warm weekends of the fall, was actually one of the coldest. I'm not sure how, but I successfully convinced my good friend Amelia (who is a talented musician and who I met through this WomenBikePHL camping trip!) to come on this one night bike camping trip. When looking for good weekend trips, I often check out the Circuit map to find trails I've never been on. For this trip, I was looking for something low-stress (read: not a lot of fast cars! ), somewhere we could do 30-40 miles a day, camp for a night, easy transportation logistics, and (of utmost importance!) the opportunity to see some beautiful fall leaves. A summertime one night bike camping trip from Philly to Green Lane Park, organized by WomenBikePHL. When I saw that WomenBikePHL was organizing a bike camping trip, how could I say no! I'd gone bike camping solo before, because I didn't know anyone else crazy enough to strap a tent to their bike and go -- and this was a chance to meet some of those (amazing!) crazies. We met at the Art Museum, got on the Schuylkill River Trail, and didn't ride on any roads (except for the short chunk of through Manayunk on Main Street that can't be avoided!) until we got to Green Lane Park. When I found out I was attending a conference in Richmond, Virginia the week before 4th of July, I set out to figure out how to tack on a bike trip! After lots of googling and advice from friends of friends, I decided to check out the Shenandoah Valley and part of the C&O towpath. I figured out that Amtrak and a short rental car trip would be the best way to go. I would be going: train from Philly > Richmond | rental car from Richmond > Waynesboro | bike from Waynesboro > DC | train from DC > Philly. That sounds complicated, but was surprisingly stress free! There are lots of other places to find good info on bikes + Amtrak (like here) but Amtrak seems to keep adding more bike accommodations (YAY!) so just check their website here for current info. On the route I took, I had to box my bike to ship it as checked luggage — see bike boxing in photos above. My stay in Winchester was probably one of my favorite people-parts of my trip. I stayed in a room through AirBnB of an amazing couple who LOVES Winchester. They took me under their wing, took me on a tour around town (including an awesome pedestrian plaza! ), went out to dinner, and helped me hang out my tent to dry on their clothesline. Because hey, I love roughing it as much as the next outdoorsy camper, but sometimes you're solo touring, having a warm homey night like that is just what you need. The C&O is definitely a gem. You don't having to worry about where your next turn is, the hiker/biker campgrounds are often (check out the campgrounds by mile marker here) and free and have water pumps, and there are friendly tourists aplenty (but not too plenty!). The night I camped on the C&O I shared the site with a college couple from Pittsburgh, biking to DC with gear strapped to their bikes, flip flops, and little experience but all the enthusiasm and positivity; a father an young son - the dad said he works a lot so loves taking a week out to ride with his son, who said he can't wait til he can take his younger daughter along soon; and a solo guy. I got to the site as it was starting to get dark, but we sat around the table and exchanged stories and then leap-frogged while riding much of the next day. My goal was to make it into DC for the 4th of July - and I did! As you get closer to DC, especially near Great Falls, the trail gets much more crowded with tourists (not always paying attention to their surroundings..), but it is nice to see so many people making use of this great park. A Memorial Day bike camping trip from Philly to Wharton State Park to the Jersey shore. On Memorial Day weekend, what better to do than ride bikes TO the beach with friends! Two rad ladies to join me, Amanda (who writes all about her travels! )- it was her first time bike camping, and she was amazing - and Arianna, who I met because she organized fun, social rides to breweries last summer! Here's the route we took. There are a variety of routes from Philly to the beach, including some that are shorter than this, but I tend to go for bike paths, scenery, and good food rather than speed. The first bike camping trip I went on, I went solo and didn't really know what I was doing. I'd biked before, I'd camped before, I'd gone on probably a 20 mile ride with a loaded bike (not the bike I'd be riding on the trip), but that's it. So I picked somewhere I knew was super friendly to bike tourists, would have a lot of flexibility in terms of riding distance, and gave me options to create a "base camp" and ride an unloaded bike some days. And, of course, somewhere I knew would be beautiful! I planned on visiting some friends in Seattle, so decided on exploring the San Juan Islands by bike during the week, while my friends were working. Ferries & Bikes: a perfect match! From Seattle, you can take the Clipper Ferry from downtown Seattle to San Juan Island. You can bring your bike on board for a fee, thoughI decided to rent a bike once in San Juan since this bike trip was only 4 days and part of a longer trip, it made most sense logistically and cost wise just to rent a bike for the days I was riding. I rented a road bike from Island Bicycles on San Juan Island and then used the Washington State Ferries to travel between the islands.